The post Frito Feet — Here’s Why Your Dog’s Paws Smell Like a Popular Corn Chip by Melvin Peña appeared first on Dogster. Copying over entire articles infringes on copyright laws. You may not be aware of it, but all of these articles were assigned, contracted and paid for, so they aren’t considered public domain. However, we appreciate that you like the article and would love it if you continued sharing just the first paragraph of an article, then linking out to the rest of the piece on Dogster.com. What is that bizarre, yet strangely comforting, odor emanating from the general direction of your dog? All you’re certain of is that your dog stinks, and it’s been bothering you for a while. When the dog nestles into her dog bed for an evening nap, you decide to conduct an unscientific survey. Moving your nose about and inhaling gently at various points, the source reveals itself powerfully. 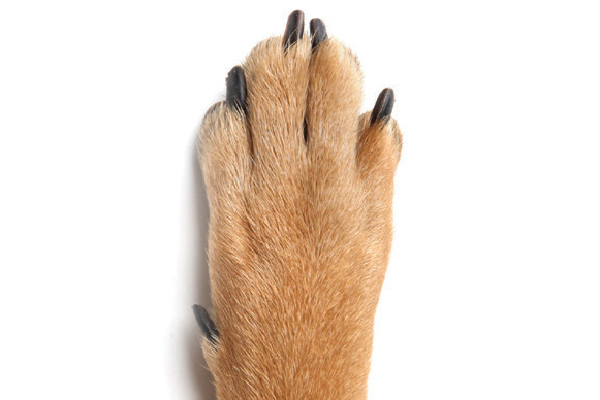 As you reach the base of your dog’s feet, you find that they reek of … Fritos? You find your fingers insensibly moving toward the dog’s feet, and as they push apart two of the dog’s toes, the scent of corn chips assaults your senses. So, what are Frito feet? What are the causes of this unusual scent that has established itself in your dog’s foot pads? How can you stop Frito feet in dogs? Let’s discover the possible sources and potential remedies of Frito feet — and other foot odors — in your dog. Are you dreaming … or do your dog’s feet actually smell like Fritos? Photography ©PakHong | Getty Images. In the “you are what you eat” school of thought, it’s assumed that a dog who has gotten into an open bag of Fritos, tortilla chips, or popcorn may simply be projecting the aromas native to these human food treats. Such conspicuous eating is not the root cause of foot odor in dogs, but it may have a decided part to play. Too many foods rich in carbohydrates or sugars can contribute to the right dietary conditions that foster the true sources of Frito feet or smelly feet. Cutting back on these kinds of treats can help, but will not strike at the real causes. It might not be as problematic as a yeast infection, but, like the fungi that cause smelly feet in humans, one source of foot odor in dogs is an unchecked proliferation of yeast fungi in and around a dog’s feet. Like the demodex mites that cause mange in dogs, the yeast fungi that underlie the phenomenon of Frito feet are naturally occurring skin-dwellers who have gotten well out of hand. A dog’s immune system typically keeps native surface mites, bacteria, and fungi in check and their population small enough to go unnoticed. Circumstances and environmental conditions must be right to produce the odors and smells associated with Frito feet. Yeasts and bacteria cannot thrive without warmth and moisture. Times of the year when temperatures are at their most extreme — summer’s humidity outside, and in winter when our heaters are running full blast — provide ideal conditions for fungal growth to outstrip the immune system’s ability to keep them checked. The spaces between a dog’s toes, and the cracks and crevices around a dog’s foot pads, are the perfect spots for fungi to thrive. Finally, when the grounds you and your dog walk on are wet, you’re both tracking things into your home upon your return. Dog owners instinctively wipe or scrape their shoes on a mat before removing footwear. Our dogs don’t! Together with a lack of regular, programmatic dog foot cleaning all contribute to the explosive growth of microscopic organisms that yield the scent of Frito feet. The odor associated with Frito feet depends on a confluence of factors, including irregular foot hygiene, warmth and moisture in the environment, and the unchecked accumulation of fungi and bacteria. Don’t forget that, while dogs may not sweat as voluminously or with the coverage of humans, many of a dog’s sweat glands are concentrated around their feet. One option is to carefully trim any excessive fur from the base of your dog’s feet. Where humans have access to topical medications, sprays, and powders to address foot odor, simple hygiene practices may help address a dog’s Frito feet. The easiest thing to do if your dog is afflicted with Frito feet is to disinfect them with a dog-safe, non-toxic solution. With a tub, basin, or other vessel that your dog can stand in comfortably, common household cleaners such as hydrogen peroxide or vinegar can be combined with warm water to form an effective short-term approach. You only need to pour in enough to immerse your dog’s feet. Encourage her to remain still with soothing words, a favorite toy, or a healthy treat, so that the hydrogen peroxide or vinegar can act on the microbial infestation, then thoroughly dry the feet, including between the toes, with a clean cloth. If your dog is also having difficulties walking, or has been excessively licking or scratching at her feet, ears, or any skin folds, Frito feet may be a symptom of a more serious health problem. When you clean your dog’s feet, check for swelling, abrasions, or other signs of possible infection or injury. A strange scent is easily dispatched, but recurrent issues with canine foot odor may warrant a visit to the veterinarian. Tell us: Do your dog’s feet reek of corn chips? How have you addressed the problem in your home? Share your experiences with Frito feet in the comments! Thumbnail: Photography by ©kickers | Getty Images.